Adventure is out there! An inspiring quote from the Pixar movie “Up”. 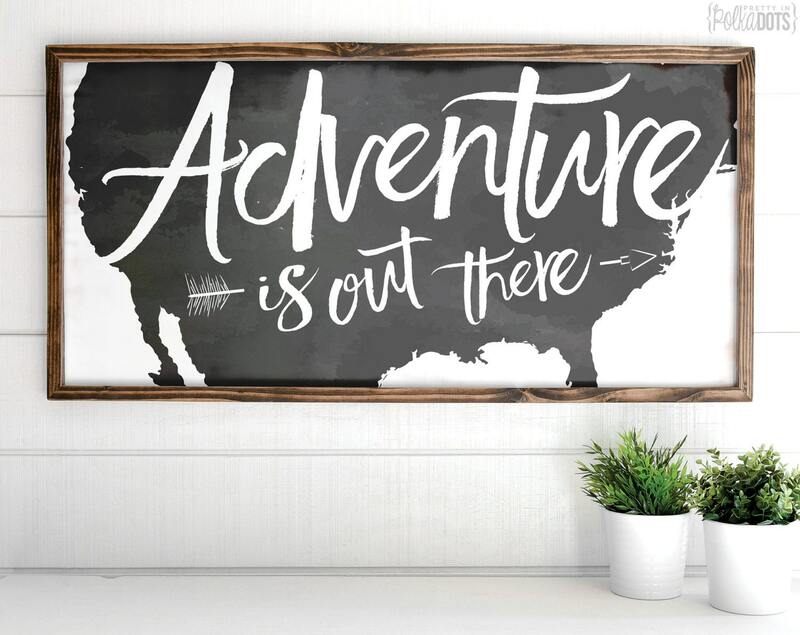 This farmhouse style wood sign contains the quote “Adventure is out there” on top of a silhouette of the united states along with a tribal arrow. A beautiful sign of this size makes a great statement piece! This farmhouse style wood sign measures roughly 4 feet by 2 feet in size. I wanted to do a Disney Up themed nursery and needed something special to go above his crib. This sign was just what I was looking for. You were right about the size too, it fits perfect 😉 Thank you so much for making the beautiful sign for me and my little boy! Love it! Perfect feature for our travel wall. Beautifully made, light weight so it’s easy to hang.